A large pile of chips were found on top of a red car outside The Merchant's House Bed and Breakfast in Frome, Somerset. 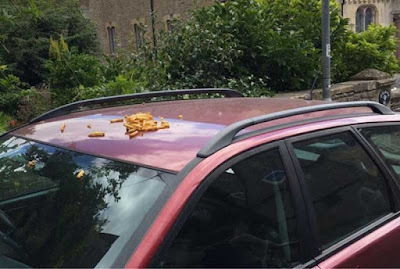 Anna Griffiths-Car passed the vehicle with the chips on it late on Sunday morning and was taken aback by the "nastiness of the act". She said: "It just seemed a bit senseless and stupid. I'm very short so if it were my car it'd be really hard to clean off. Perhaps they'll wait for seagulls. 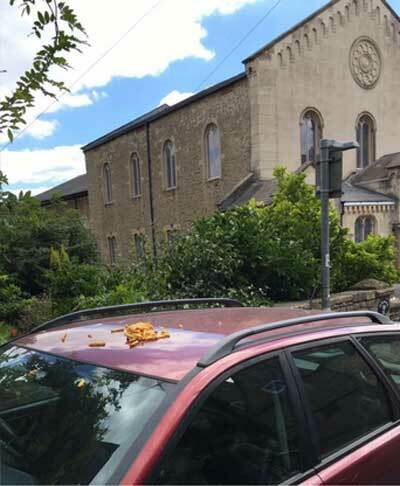 "I think you see daft things like that everywhere from time to time, particularly on Sunday morning. We've all done stupid things after a few drinks. I guess it's actually pretty harmless in the scheme of things."